When my son was about a year old somebody gave us an box of old books destined for the charity shop. Among them were a small handful of Ladybird books, very battered with no spines and lots of scribble. Opening these tired old books, the memories came rushing back with the nostalgic force normally associated with an evocative scent. 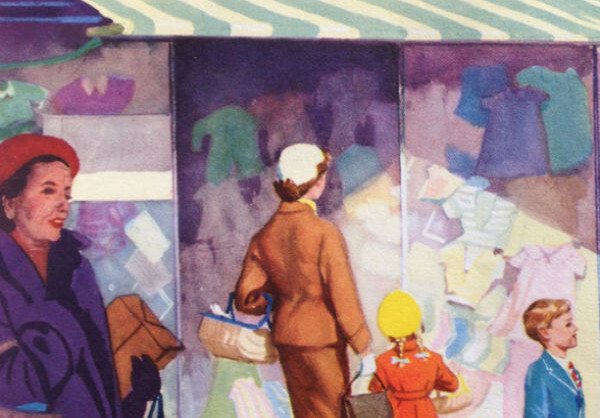 One of the books was ‘Shopping with Mother’, where Mother, wearing a trim brown suit, a hat and white gloves, goes shopping with John and Susan. Their shopping trip takes them to the butcher’s, the hardware shop (to buy a hammer for Daddy) and the draper’s shop to buy socks for Susan. Finally, they go to the florists, because John and Susan choose to spend their pocket money on flowers for mummy. This book had a strong effect on me, and on my baby son. Whilst I was suddenly transported back to my childhood in the 1960s, where such things as draper’s shop’s were reality of life, my one-year-old son showed a remarkable attentiveness to the illustrations. The detailed drawings and vivid colours, though depicting another era, seemed more appealing to his eye than so many of the cartoon-like illustrations in the cheaply printed children’s books that he had commonly met in the first months of his life. The next book, we looked at was from the ‘Peter and Jane’ reading series. There was Peter in his grey shorts and red pullover; there was Jane with her improbably white frock, yellow cardigan and neat hair bow. These were the books that taught me to read; these two children were as familiar to me as any other of my childhood playmates. The typeface, the images and colours all took me back to the days when the three or four words of text on the page presented me with a powerful challenge and the illustrations hinted at the way life ought to be. Meanwhile, my son was enjoying looking at a picture of a ball that looked like a ball, a dog that looked like a dog, a tree that looked like a tree. I resolved then and there to pick up a few more of these books and began keeping my eye open for them at jumble sales. Initially, my intention was to find copies of all those Ladybird books that I remembered from childhood, and also to collect the entire Peter and Jane series. 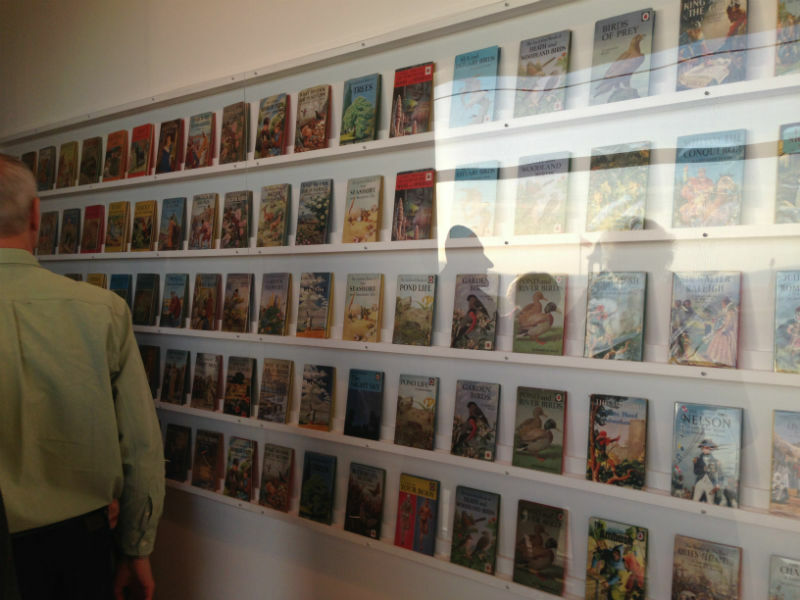 But – and herein lay my downfall – Ladybird books come in numbered series; how many of us born with the collecting gene can resist the appeal of finding the next series number, of completing the set? Some sets have only two books in them – others have over forty. A couple of ‘sets’ have only one book in them – and these are among the hardest of all to find. Before long I was collecting sets of books I barely remembered at all. Each new find with a different series number represented the start of a new quest. And then there are all the variations of the same book title: the revisions to take into account the fact that years have passed and the world was changing – that The Policeman no longer made phone calls from a ‘tardis’, that a man had now walked on the moon, that women were occasionally employed in jobs outside nursing and teaching. In the 1970s almost all the illustrations of the 36 Peter and Jane books were re-illustrated in an attempt to bring the children more up-to-date, to replace the frocks and shorts with jeans and the unfettered depiction of childhood spent roaming empty streets alone to buy sweets and swim in rivers with a more constrained depiction where swimming takes place at supervised pools and where the children no longer chat to strangers. These variations documenting shifting social values fascinated me. Of less interest to me were the minor variations in cover design and layout – although many collectors embrace these with enthusiasm too. Initially I had no idea that there were other collectors out there. I was driven to amass more and more of these little books and to pick up knowledge of their age and history as best I could from the few clues that were to be found in the books themselves. 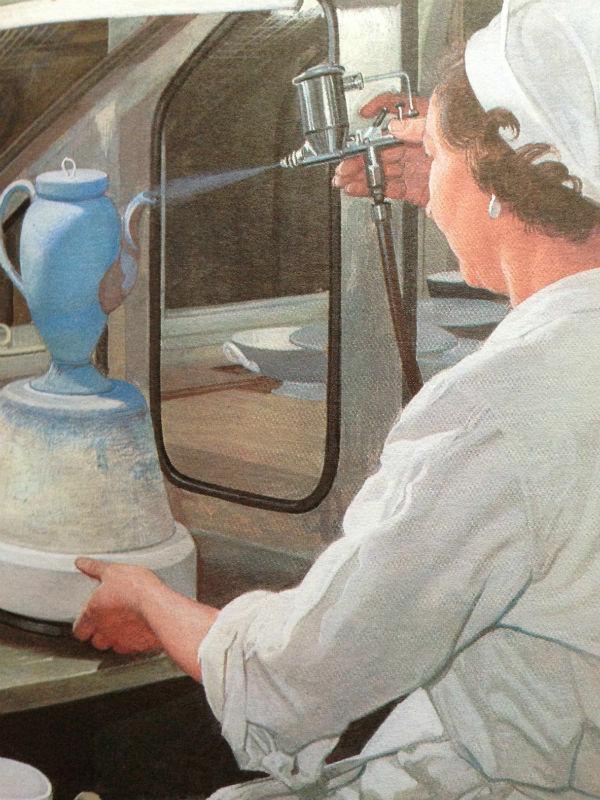 Ladybird Books were still being printed – but they seemed a very different beast from the earlier ones. They were shiny alien beings – registered in Maine in the USA and not Loughborough, Leicestershire – their stiff, glued-in pages volunteering little about their evolution or ancestry before coming loose and dropping out. However, in about 1999 I tried looking on the internet. I remember clearly the words I tentatively typed into an early search engine:“Collecting Ladybird Books”. The results of that search amazed me. I was not alone! There were already two or three websites dedicated to the hobby and a lively discussion group where collectors pooled their knowledge and built up a shared understanding of the history of Ladybird, listing the books that had ever been printed and debating their relative scarcity. Of course, I joined these forums, I learnt from these other collectors, and little by little I began to contribute too. Before very long I wanted to have a website of my own, uncharacteristically undaunted by the fact that I scarcely knew one end of a computer from another. I bought a book called Teach Yourself HTML, and, slowly and painfully, making every possible mistake, my website began to take shape. It took nearly a year to build and get online but over the years a wide range of people with a connection to Ladybird got in touch with me – other collectors, parents and grandparents seeking treasured books but also ex-employees of Ladybird, Ladybird artists, writers and their relatives. Many of these people I met, some I made friends with. Although superficially very different, my Ladybird acquaintances tended to be characterised by a certain self-deprecating humour, and a streak of quirkiness; perhaps these are the minimum entrance requirements into Ladybird Land. 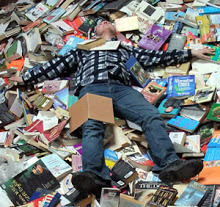 Of course, it didn’t take long for my house to fill up with books. The process of ‘upgrading’ a collection is unending and as each ‘better’ edition came in, its predecessor was consigned to the loft. But inevitably they soon began to infiltrate the rest of the house too. 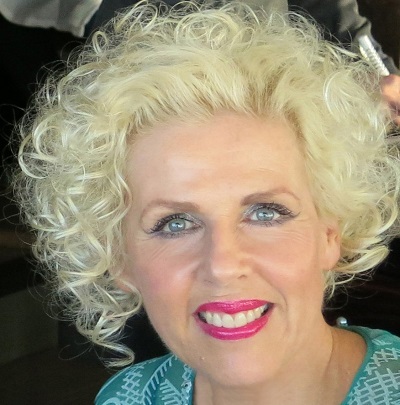 Once, when my husband opened the drawer of a new piece of furniture only to find it already colononised by books, he wryly remarked that living in our house was like living in the concentration camp in the film The Great Escape, where the POWs walked around the camp, surreptitiously depositing the sand from their tunneling. But for me the pleasure of my hobby was only partly the satisfaction of acquiring more and better books. 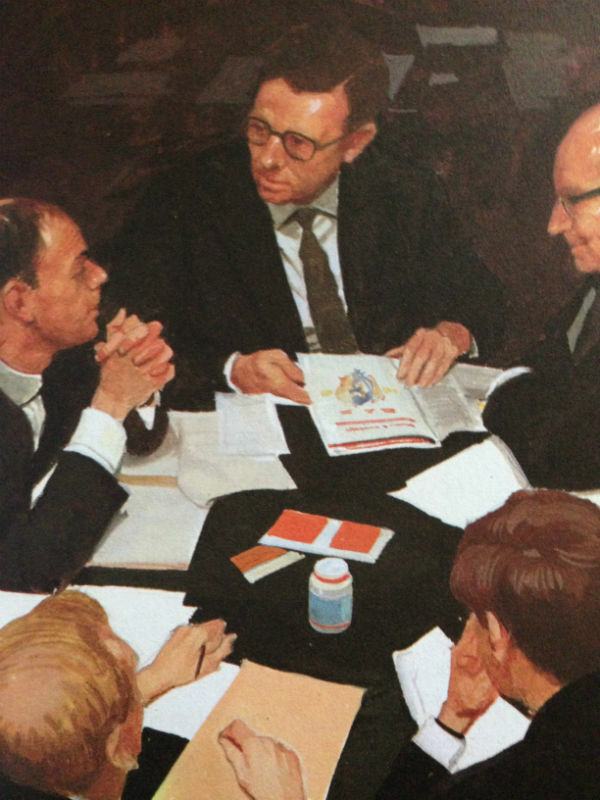 The more I came to understand the history of the company the more fascinated I became with the background, the context and the individuals who contributed to the phenomena that was Ladybird in the 1960s and 70s. 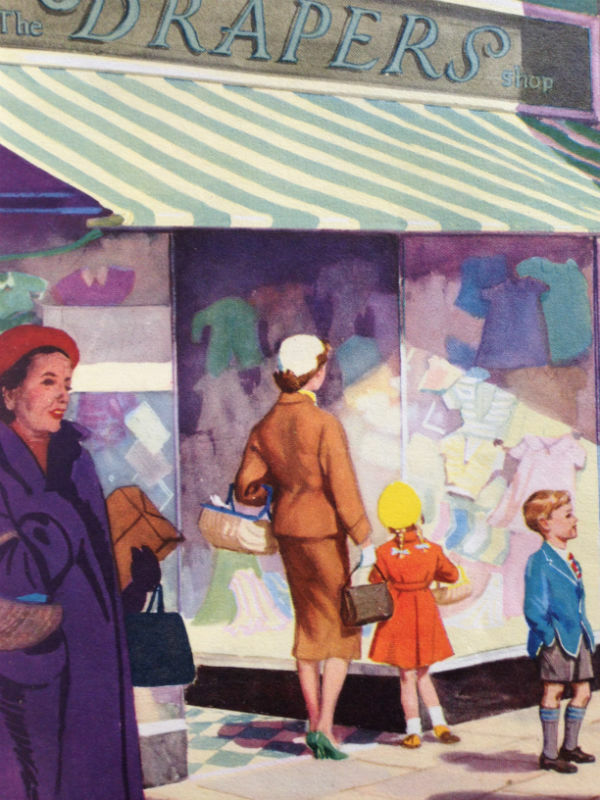 The history of Ladybird overlays the economic development of Britain in the later part of the 20th century from wartime austerity, rapid reconstruction, boomtime and slump. The story was engaging too because, even at its peak, Ladybird was something of a cottage industry with a small board of directors and decisions made around kitchen tables. Artists and writers were engaged through local networks, friends of friends and often relatives and the workers at the Loughborough printworks frequently described it as ‘one big family’. Ladybird was built on a human scale; although enjoying worldwide success it was, in those days, very well rooted in its Loughborough home. This made it both accessible to research and rewarding to the researcher; ex-employees were often only too keen to talk about their time at the company and bitter only about its perceived ‘demise’ when the Loughborough works were finally closed. Understanding more about the history and context adds an extra dimension to collecting but the books themselves lend themselves to this hobby. 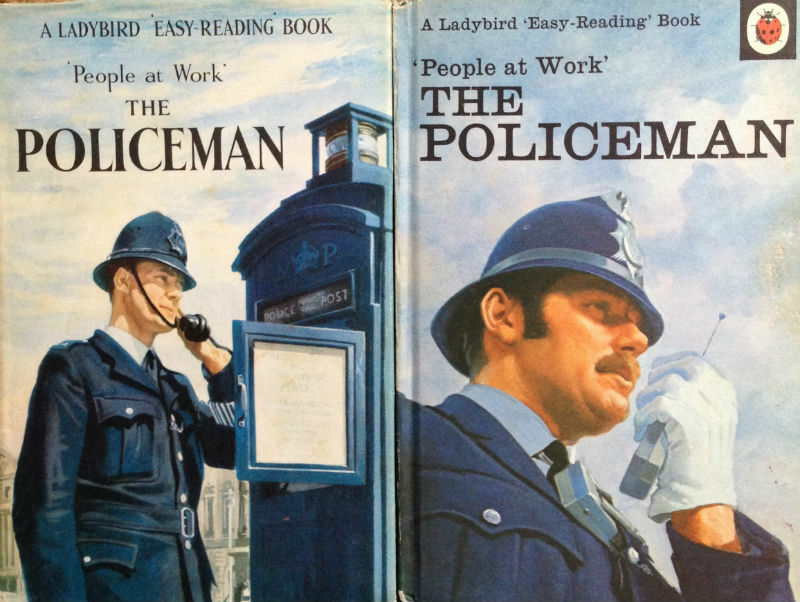 Rather than looking dated, the years are increasingly kind to Ladybird Books. With the passing of time the Britain that they document over several decades looks an increasingly remote curiosity. Where once to my eye John Berry’s amazingly vivid depiction of the British workplace in the 1960s and 70s looked sober, dull and factual, now the illustrations of such books as ‘The Car Makers’, ‘The Pottery Makers’ or the ‘The Shipbuilders’ seem a treasure-trove of social history, attitudes and values. Furthermore, the hobby is very accessible; the books in the 60s 70s and 80s were printed in vast numbers and as a result can still be picked up from car boot sales, charity shops and online. Unless you have a taste for 1st editions or the oldest, rarest books you can still find most titles for pocket money – albeit sometimes well worn and well read. Their neat, uniform size make them easy to store and display (happily the same height as DVDs they fit neatly into media shelves – unless your collecting habit gets wildly out of hand, as mine did). The vast majority of books in my own collection have been picked up second-hand in this way (or sometimes by swapping books with other collectors) and I’ve had more than my share of good luck. One day, for example, I found a whole range of super-rare 1940s books in a second-hand book shop in North Wales, all on sale for a few pounds; (only a collector will understand the warm, fuzzy place that day holds in my memory). 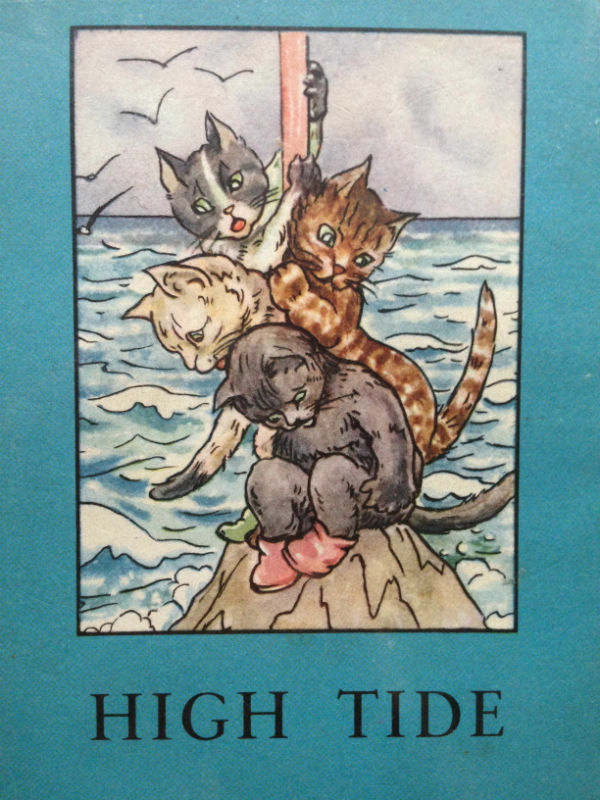 By far the most I ever paid for a book was £300 for a good edition of the elusive “High Tide”, the last book issued in the first real Ladybird series. Some of the guilt I felt at this extravagance was assuaged by selling off a few of my swaps to other people newer to collecting – and so I went on, piecing together the collection I have today. People often ask me: Are you still collecting? I’m never sure how to answer. My collection is pretty well complete. There are no books I feel I need to acquire; if people approach me with books for sale I generally point them towards eBay or a specialist dealer. But is my interest in this 20th century phenomena still active and absorbing? Very much so. As both child and adult Ladybird books have amused, informed and entertained me. Once I enjoyed the stories and the pretty pictures, now I enjoy the research, the social history … ok, and the pretty pictures. I think I always will. 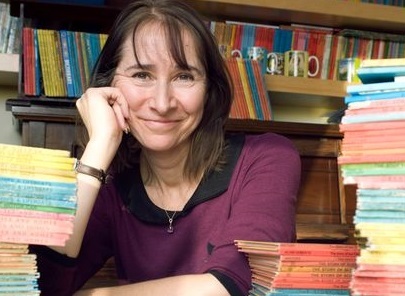 Helen Day is a Languages Teacher and avid collector of Ladybird Books. 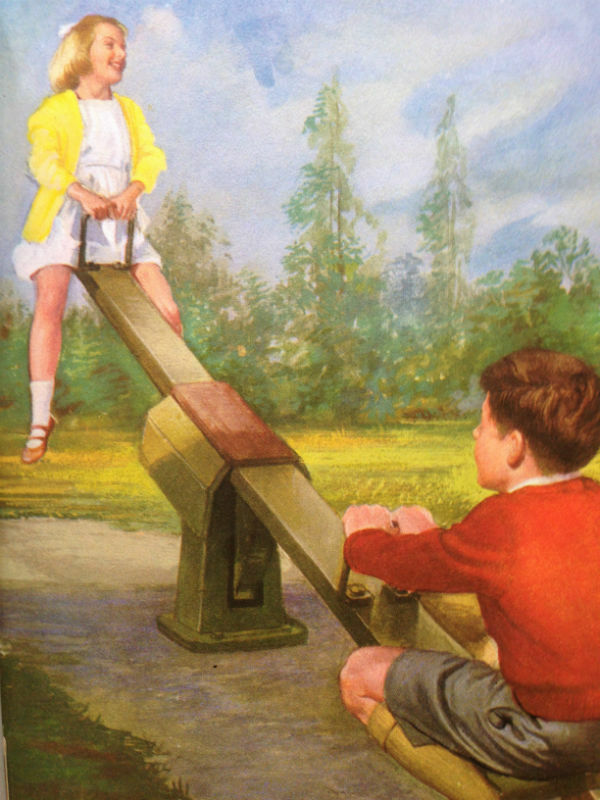 She curates the definitive Ladybird Book website at www.ladybirdflyawayhome.com . A local industry indeed. I remember years ago getting off the train at Loughborough station and seeing a plaque (I remember it as vast, but memory may well have allowed it to grow in my mind’s eye) depicting a large ladybird in low relief and the words, ‘Welcome to Loughborough, home of Ladybird Books’. I wonder where the plaque is now. I am the proud owner of an original Martin Aitchison Peter and Jane illustration and my loft buckles under the weight of Ladybird books. My favourite titles are the three nursery rhymes collections, which I’ve subjected both of my sons to over the years. The three blind mice with their Stevie Wonder sunglasses are particularly memorable! Have just taken a trip down memory lane looking at Ladybird covers on google images and trying to spot my favourites: Five Little Kittens and The Story of Clothes and Costume. Also remember Helping at Home (a good one for your son, Worm!) and there was another that included a nightingale? And King Alfred burning cakes?? Can’t for the life of me recall the title. What a fun and understandably absorbing hobby, Helen – and an entertaining way to study social history. I have quite a lot of time of both the above, especially Anorak, but at times you yearn for, well, the ligne claire, the solid realism of the Ladybird style, rather than the rather bourgeois bohemian approach.